Those of you that are regular readers of my blog (thank you muchly btw!) will remember that for our ten year anniversary my Mister and I visited Dublin (here and here). What was meant to be a fun and romantic trip away ended in disaster as poor Mr P was ill and bed bound pretty much the whole time we were there. We don't have the best track record with holidays as it goes, but I'm always determined for us to have a good time so when we returned from Dublin, I booked an impromptu trip to York to make up for the disaster!! I figured that at least York isn't far from home, so any bed bound related illnesses this time could easily be rectified! York, thankfully, was perfect! We stayed at the absolutely gorgeous Best Western Dean Court Hotel, a four star that is literally about twenty paces from York Minster. The breakfast room overlooks the Minster too, so it was lovely to dine with such a beautiful view. We spent Sunday afternoon at the York Designer Outlet (read about it here! ), one of our favourite places for picking up discount designer goodies. We returned later that afternoon to chill out in the hotel with a glass of champagne (a Christmas present I'd been saving) complete with amazing Strawberry Popaball bubbles floating to the top (think Bubble tea but better!). For our evening meal, we opted for Rustique as we are massive fans of French cuisine. We've visited the Richmond Rustique before, so we were keen to try the original in York and it did not disappoint. We chose the set menu and each chose pate to start, followed by duck leg with mustard potatoes and the most amazing creme brûlée to finish. The set menu is great value for money (I think three courses was around the £20 mark) and the food was absolutely delicious! We ended our evening with cocktails in Missoula and All-Bar-One (one of my favourite cocktail places!). It was lovely to enjoy and drink and a giggle with my Mister and thankfully the weather stayed lovely too! There's nothing worse than going out and getting soaked!! One cocktail too many Kayleigh? I'm such a lightweight!! Sunday morning began with one of the best hotel breakfasts I've ever had. Yes, I did just have porridge but for some reason, porridge in hotels in a million times nicer than at home...how do they do it? It was absolutely delicious and the view made it taste even better! The view from the front of the hotel! How lucky we were! After breakfast we spent the whole day shopping (we did stop off for pizza for lunch and then a late afternoon cake at Patisserie Valerie) and as it was a Monday, it's the quietest I've even seen York centre. It was lovely to wander around, take it all in and relax. On our travels we visited 'The Fudge Kitchen' and watched the fudge being prepared. The smell was absolutely amazing, so amazing that obviously we had to buy some! The slabs are sold by weight, so we took advantage of the four slabs for £12 offer and opted for White Chocolate, Salted Caramel, Strawberries and Cream and Toffee (you can freeze it so we saved some in the freezer at home for later!). My favourite was definitely the strawberries and cream, so fruity and smooth, it was perfect and melted in my mouth! Before we left to come home, I was treated to some Lush goodies (thanks Mr P! ), and I managed to pick up a cute little summer top from H 'n' M. Unfortunately I also had to buy an umbrella as the rain decided to come just before we left. We had an amazing couple of days though, and although I've been to York a million times, I'd definitely recommend it for an overnight stay; it's such a gorgeous city! Our post-anniversary trip was definitely worth the wait! Have you ever stayed over in York? Looks like a lovely little break - I always take a bottle of fizz when we stay in a hotel too - it is rather weird drinking out of a tumbler (or sometimes even worse - a coffee cup!). The views from the breakfast room are gorgeous - I will definitely consider choosing Best Western after seeing them! I also can't visit York without a trip to Lush. One time they let me have a bathbomb for free as it was my birthday! Firstly! LOOK AT YOUR PORRIDGE NEXT TO CHRIS' FRYUP! WHATTTTT??! Ha ha! Sometimes I look at a breakfast menu and think porridge sounds nice, but then my greedy voice kicks in and I know I have to have something cooked and yummy! Love Missoula, I've been in twice now and each time have wanted to put it in my suitcase and take it home! My friend's sister is manager at the Fudge Kitchen so we had loads of fudge at her wedding, it was on the tables as favours and then there was loads left over so we were pretty much munching on it that entire weekend. Shopping in York is always a joy, I'd love to go during the week cos it just gets so busy at weekends, the Shambles are a nightmare to navigate! Love the top, the print is gorgeous and it's crying out for an evening at the Botanist! That view at breakfast looks amazing and that fry up is making me hungry just looking at it! I really liked York, did you get to walk around the walls? The Fudge Kitchen looks brilliant! Looks like you had a fab weekend away - absolutely love York. Such a great little city, oozes charm. That's a rather awesome view of the Minster from brekky too, how fab! (Talking of brekky, much as a love a bit of porridge, Mister's looks amazing, hehe). That fudge looks yummy, I don't remember seeing The Fudge Kitchen when I was there before - I shall have to go hunt it down next trip! Yes definitely do, it's on the Shambles! 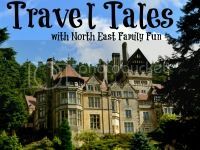 Commenting again to say thank you for linking to travel tales - LOVE York - we are hoping to visit with the kids this Summer.